SAN FRANCISCO, Sept. 25, 2018 /PRNewswire/ -- Quantstamp, a smart contract security company, is proud to announce the signing of an MOU with the Mythril team. The parties will focus on the synergies between the Quantstamp protocol and new Mythril Platform analysis engine built by the team behind the popular open-source tool, Mythril OSS. The Quantstamp protocol utilizes nodes to audit smart contracts for security vulnerabilities and produce publicly verifiable audit reports. As these nodes intrinsically rely on analyzers such as the Mythril open-source tool to discover potential security vulnerabilities, any improvements to analyzers also benefit the protocol. 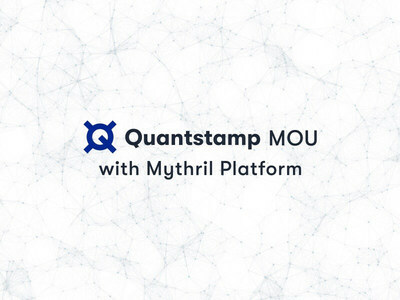 As Quantstamp explores additional ways to integrate Mythril technology to the protocol in the future, this synergistic partnership will create even more value for the community. "Automated security is a hard problem to solve and it affects everyone in the smart contract ecosystem," says Quantstamp CTO Steven Stewart. "We know that in order to protect users, help developers and ensure the mainstream adoption of blockchain technology, industry security leaders need to work together to solve this difficult problem." The Quantstamp protocol was developed to enhance the security of smart contracts and facilitate the mainstream adoption of blockchain technology. Since Ethereum launched in 2015, over $300 million dollars worth of ether was reported either lost or stolen due to security vulnerabilities in smart contracts. Despite the existence of these vulnerabilities, the number of smart contracts published on Ethereum continues to grow but manual auditors do not have the capacity to scale with this growth. The Quantstamp protocol produces automated audit reports that scale with the growth of smart contracts. These audit reports are also publicly verifiable, meaning that users can individually verify that an audit took place and view the report. Mythril was originally developed by Bernhard Mueller, who is now leading the development of the Mythril Platform at ConsenSys Diligence. Mueller is an award-winning engineer and an experienced white hat hacker. He has found critical bugs in products for companies including Microsoft, IBM and Sybase, and received BlackHat's "Most Innovative Research" Pwnie Award. "By integrating Mythril Platform technology into Quantstamp's decentralized computing infrastructure, we believe that we can enable powerful types of security verification that wouldn't be possible (or would be very expensive) to do with traditional architectures," says Bernhard Mueller. "I look forward to exploring ways in which we can work together and solidify the future of smart contract technology." Mueller is well known in the Ethereum developer community for creating Mythril OSS, a widely used open-source Ethereum smart contract analyzer and one of the two analyzers utilized by the Quantstamp protocol. The new Mythril Platform was developed to improve upon Mythril OSS. Quantstamp is a smart contract security company that is developing the Quantstamp protocol and automated security tools, and that conducts manual audits. The Quantstamp protocol enhances smart contract security and the reputation of projects that create smart contracts by producing publicly verifiable audit reports. The betanet version of the Quantstamp protocol was recently released on the Ethereum mainnet. The Mythril Platform brings security into smart contract development environments and build pipelines. Built by the creators and community of the popular open source Mythril tool, it bundles multiple bleeding-edge security analysis techniques into an easy-to-use API that allows anyone to create purpose-built Ethereum security tools.